The content described here was removed from the game after Update 13. 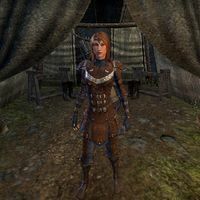 Adelie Metivier is a Breton leatherworker who can be found at the Armory Merchants marketplace located at the Northern High Rock Gate in Cyrodiil. When approached, she is confident in her goods, "My armor protects and conceals. Neither heavy nor light armor does both!" This page was last modified on 23 February 2019, at 23:53.